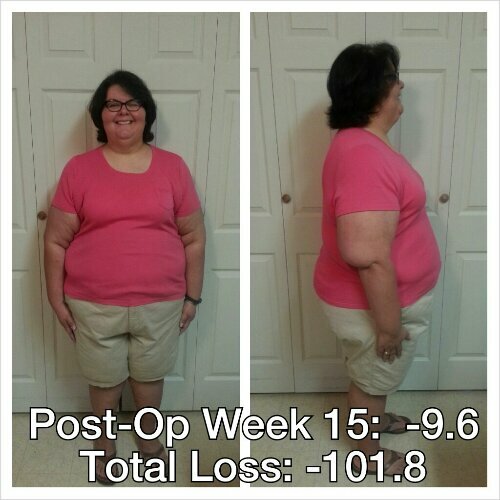 This week’s trip to the scale was more than just a weekly measure. This week’s trip to the scale was simply EPIC. I was not expecting this week’s loss to be so great. But it was. I stepped off and on the scale multiple times to confirm that I’d seen the numbers correctly, especially the first number. I seriously couldn’t believe what I saw. The scale displayed numbers I’d never seen before. For the first time in my adult life, I was seeing a 2 as the first digit of my weight. My heart swelled. I wanted to cry tears of joy but none would come. I think the excitement I felt was greater than the joy and inhibited any tears that might have formed at the sight of the 2 on the scale. After I got off the scale, I did the math in my head: I’d lost over a hundred pounds. In four months. I couldn’t believe it. It’s funny–I look at the composite above and that’s the only way I know that I’ve lost as much as I have, because I still don’t feel like I’ve lost that much. Again with the brain being a little slow on the uptake during this weight loss process! Why is it that everyone else sees it but me? I was terrified that after last week’s big loss of 7 pounds that I wouldn’t see a loss this week. In fact, I was afraid I’d see a gain because in the past, whenever my body lost a large quantity of weight, weight loss slowed down or worse, stopped. 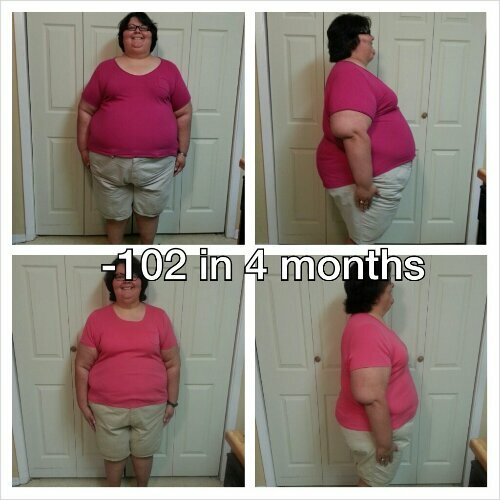 But this time, my body didn’t do either of those things–my weight loss accelerated. I just kept doing what I’ve been doing all along: eating between 800-1000 calories, with most days being around 900 calories; getting 80+ grams of protein daily; drinking 14-16 cups of water daily, and trying to get 6-7 hours of sleep a night. I also see a therapist weekly and attend a weekly weight loss/lifestyle changes support group, both of which have been instrumental in helping me to be successful at this attempt at weight loss. The surgery is merely a tool. How you choose to work that tool determines your success. I knew that if I was going to be successful at this that I’d need to have a holistic approach. Next on my list is to visit a PT to get an evaluation so that I can start being more physically active than just walking–one of my goals is to play golf and tennis again. But I need a physical therapist to evaluate my range of motion and to help me rehab an old knee injury before I think about doing either of those things. 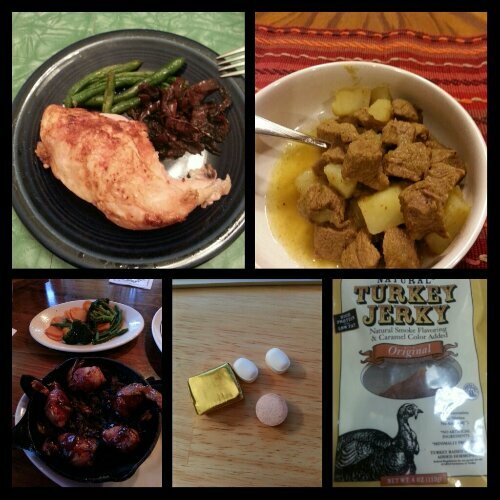 Today’s food choices, from upper right: chile verde stew made with beef (not shown, the 1/2 ounce of Jack cheese that was on top); Trader Joe’s turkey jerky; multivitamin and calcium supplements x2 with iron supplement; leftover chicken and shrimp enbrochette; baked chicken breast with green beans and caramelized onions. This entry was posted in celebrations, daily bites, eating, goals, la guerra, post-op, success, the body is a funny thing, vsg, weight loss surgery, werk! and tagged benefits of wls, daily bites, little celebrations, photo post, post-op eating, post-op life, progress report, sleeve gastrectomy, things of win and awesome, VSG, vsg realness, WLS. Bookmark the permalink.